How does FLK Light Sensor Technology work? How does the Dynamics knob work? What do the “Velocity Curve Edit” knobs do? Piano action versus keyboard action. Which one is better for virtual piano music? Why is a LACHNIT MK more expensive than other keyboards? Is playing a LACHNIT even three times better? 4096 High Resolution MIDI dynamic resolution? The dynamic performance of FLK keys has been designed by reference to intricate measurements taken of a Viennese professional concert grand as well as of different other grand pianos. By pressing a key the FLK action accelerates a touch weight hammer, which is connected to the key only through the force of gravity. It is - in a way - moving freely, just like in an acoustic grand piano. Even a very short tap of the key with sufficient acceleration can produce a sound. To ascertain the correct hammer velocity, the most significant measured length has to be as close to the striking point, the point where the hammer produces the sound, as possible. On a concert grand the key reaches this point at about two thirds of the key dip. FLKeys ascertains the hammer's velocity and directional data accordingly at two thirds of the key dip, which ensures the authentic timing. Note Off is reached at the halfway point when releasing the key, identical to the damper touch down of a concert grand. In Piano Mode Note On is only possible when the key travels at a certain speed. Therefore, very slow key velocities will not produce a sound. All measured data is acquired with a resolution of approximately 32.000 levels and at a time accuracy of ±2 milliseconds. In collaboration FLK and TVE developed a new data processing technique, which translates direction of the key movement, moment of key touch, the hammer velocity during the key touch and the release and moment the note ends (damper touch down) into corresponding MIDI data. The exact location of measurement and therefore the “escapement point” are adjusted manually for every single key individually. reproducibility, the result of every key stroke is reliably invariable. "You can 'trust the keys' "
The measurement’s resolution of FLK’s Sensor Technology has over 32.000 levels, which are linearised to 256 internal values. The FLK Dynamics knob alters the mathematical formula and changes the way the measurements are linearised. To ascertain which values have to be altered how to give the artist the highest possible and natural dynamic range while rotating the Dynamics knob, is an art in itself. The purpose of which is that our keyboard is always well and pleasing to play, however the Dynamics knob is adjusted. Other keyboards use silicone contacts for measurements which are much more inaccurate and outdated. In addition, the resolution is lower and often does not even reach the potential 0 – 127 MIDI values. Therefore, other manufacturers only use 3 – 5 (hard – regular – soft) rarely 10 dynamic levels, which only shift velocity values and subsequently reduce the dynamic resolution further. As a result reproducibility is extremely difficult to achieve. The true dynamic control is the result of FLK’s high resolution of 32.000 dynamic levels. Due to the fact that the Dynamics knob alters the mathematical formula used to linearise, the resolution of the doubled MIDI range 256 is always maintained. However the Dynamics knob is adjusted - even to the extreme – the whole MIDI range of 127 is always utilised.By the utilization of internal 256 linear values an even more precise assignment to the MIDI values 0-127 is possible. Is the Dynamics knob adjusted to “Classic” then the greatest differences in strike velocities are possible. As a reference our team used measurements of a professional concert grand (Bösendorfer Imperial). To play the loudest possible forte (loudest sample or velocity MIDI 127) the keyboard player has to accelerate the keys and therefore the hammers exactly like a concert pianist has to accelerate real piano keys and felt hammers. Is the Dynamics knob adjusted to “Pop” then the smallest differences in strike velocities are possible. The keyboard player only has to accelerate the keys slightly faster to play the loudest sample or velocity MIDI 127. However, the differences in strike velocities from very slow (very soft) to very fast (very loud) are still assigned separately to every single one of the 127 MIDI values. In all settings – from “Classic” to “Pop” and everything in between – the same high resolution is always maintained. These two controllers adjust the volume on individual section of the keyboard. They can be used separately or together to create more complex velocity curves. Dynamics and Velocity settings can be saved under the current program. There are 16 programs available to save different settings. Piano action versus keyboard action. Which one is better? To answer this question we interviewed Friedrich Lachnit, company boss of FLKeys, who has been working as a piano concert technician for a long time. Later he headed the CEUS project for Bösendorfer. "After testing acoustic piano action extensively, we ultimately decided that - for our purposes - the keyboard action was better suited. While making that decision we looked for the amount of maintenance required, sturdiness, sensitivity to malfunctioning, weight and intended use. The piano action is built to produce sounds in an acoustic resonating box. By striking a key a hammer made of felt is accelerated to a certain speed. Its purpose is to hit the piano strings and cause them to resonate as softly and as loudly as possible. This form of sound generation was first developed about 300 years ago and after gradual improvements, let’s say, perfected by 1900 with the introduction of the modern grand piano action. Back then piano makers had to use the materials available to them, which were felt, leather, timber, bone glue, cast steel, iron...However, what they were able to create from this rather simple materials is amazing. Today this technique is still widely used for building pianos, not only because of acoustic and tonal properties. Musicians' hand and finger muscles work best within a certain range, where they are able to control the movements perfectly. Over time the piano action has been improved and adjusted to fit into that range and give musicians the opportunity to use their full potential. There is really not much left to improve on a professional grand piano. Keyboard action, on the other hand, was initially only used to operate electrical contacts. The only thing the keyboard action had to do in the beginning was to open and close the electrical contacts. There was no need and no means for measuring acceleration and velocity and translating it into dynamics. Only after electric sound generators became more complex, it was possible to play different volumes with one key. However, it was still difficult to play with expression because the keys were too light and springy. Subsequently, the first weighted keyboards were developed followed by keyboards with small hammers underneath the keys to give musicians more freedom in the control of dynamics. This development towards the optimal "working range" for musicians started in the 1970s using materials available then. Besides metal and felt new materials were used, which had just proven successful in the industry, like different plastics, PVC, rubber, silicone, laser cut drawing sheets etc. because of course acoustic and tonal properties were irrelevant. It just was (and is) all about the right feel and touch for the musician while controlling electronic sound data with his fingers on black and white keys. Why then use a grand piano action to control an electrical mechanism? Felt, timber and leather can change when they are exposed to different environmental influences. This means that the many several small parts in the piano action are constantly varying and therefore have to be frequently readjusted or replaced. Moreover, they are more easily worn down and some of them even can get stuck. Without maintenance the response of the action will become unpredictable and ever-changing. For a piano key action to maintain well adjusted and able to be played perfectly it has to lay on a suitable, specially levelled and extremely stable foundation. For grand pianos this is usually the keybed made from selected spruce or special laminated wood mostly 4 cm thick. The total weight would be about 80-100 kilograms. Furthermore, the mechanical acoustic sound produced by the force of the hammers (now waste ! ) has to be eliminated again. As a piano maker at heart, of course I love a piano action from the mentioned natural materials, but for a electronic keyboard it is not really suitable. Even parts like solid wood keys with balance rail are sensitive to environmental influences. Felt punchings, key garnishments swell up - stuck, wood can bend,split or break and a necessary suitable and stable key frame is too heavy for a keyboard. This is why a high quality, state of the art keyboard action combined with the expert piano makers knowledge reviewed and refined, is for us currently the best option to deliver musicians who like to play mostly virtual digital piano style music." We decided to use an external power supply for the following reasons. The working voltage inside the casing of a FLK keyboard is never higher than 12 volts. Users are safe from injuries and damage by high voltage current. If someone were to trip over the power cord during a live performance, the relatively thin 12V cord would simply be unplugged or in the worst case torn apart. The LACHNIT MK will always remain undamaged and safely standing on its stand. It would just be turned off but as soon as it is plugged in, it is operational again. If the same thing were to happen to a keyboard using for ex. an IEC connector, the whole keyboard would be pulled off its stand and would probably be too damaged to continue to be used during the performance. The external power supply can be easily replaced, but “my” LACHNIT MK almost irreplaceable. An external power supply prevents possible interferences due to alternating current. The FLK power supply automatically processes input voltages from 100 volts to 240 volts/ 47 to 63 hertz. Plug adapters for the small European plug of the included FLK power supply are easier to obtain than adapters for high voltage unit cables. There are many different types of voltages in electrical outlets worldwide. The FLK power supply (12 volts, 1.5 ampere, round plug 5.5mm x 2.1mm, positive pole inside, negative pole outside) uses the most common type and is available almost everywhere with different plugs to match the local electrical outlets. Every LACHNIT MK keyboard is built manually and every single key is individually adjusted for evenly smooth moving and finely regulated multiple times. This and several other details are the reasons why our keyboards are so excellent to play. All these delicate work can only be done manually by the most highly trained instrument makers, who deserve to be paid appropriately. The LACHNIT MK was developed entirely in Austria and is manufactured in Vienna. To keep the price of our keyboards from reaching astronomical heights, we do not include all the development expenses. Expenses were especially incurred by the development of FLK Light Sensor Technology, which took several years. When choosing a musical instrument, you should look beyond the economical, the price, expenses and value, or you would probably never buy any musical instrument. But that would leave so much joy and happiness behind, yours and your audience’s. Not using a bad and unsuitable but common metaphor about cars (Audi – Porsche), it is best explained this way. There are concert grands from mass production and then there are those made by traditional European manufacturers. All of them sound like grands, with nearly the same volume and dynamics but there is still a (little?) difference between them. For some people the difference is not so big and so it is insignificant, for others it makes up the soul of an instrument. To achieve this distinction, to breathe the soul into an instrument, much more effort, experience, craftsmanship and individual attention has to go into every single instrument. How much is an instrument’s soul worth to you? How much is the musician’s joy and happiness worth? Any kind of digital stepping is at some point a limitation, dulls the senses faster and quickly leads to boredom. Yes, this might be true: Not even 127 steps can be deliberately played individually. Also it is impossible to consciously distinguish one step out of the 127. But that is not what it is about. The audible steps are limited to 127, so eventually the musician will catch the same step involuntarily. Even though they come in various combinations, the acoustic colours of the individual notes repeat themselves. With our MK22 to "fill" (or to activate) all the MIDI steps from 1 to 127 takes on an average one minute. For example, playing in mezzo forte with medium strike will activate ± 10 MIDI steps. Within these 20 steps the user will involuntarily reach the same MIDI value many times and consequently produce the same exact sound as before. In contrast, it is impossible to reproduce the same exact sound on any acoustic instrument, where each new sound is the unique result of interacting "analogue" processes. On a serious level it is therefore impossible but also not desirable to replace a "real" acoustic grand piano. Our goal is to give musicians as much joy in playing with our keyboard as they would have with a real high quality instrument. To increase the resolution (to 4096) means that playing in mezzo forte activates about 640 different steps and it takes a lot more time until the exact same sound is produced twice. As a result the sound is livelier and more divers. Held or pedaled chords enrich the overall sound with more overtones and colors. So musicians are able to influence the resulting sound even more and can transfer more of their personal musicality. Of course it requires adapted sound software. The most promising is the physical modelling technology as it calculates each sound in real time based on the datas of the measurements taken of the keyboards sensors. 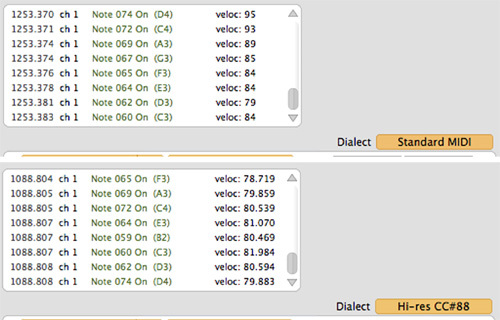 For example Pianoteq Version 3.6 or higher is MIDI Hi Res compatible. Other software producers will certainly follow soon. No other keyboard manufacturer makes such high demands on its keys like we do. Hardly any other (except the manufacturer itself probably) has been exploring the possibilities of the Fatar TP40W as intensively as we do. Now we have achieved a real breakthrough. We found a way to subtly form and shape the keys. One by one we put every key in its best position. Key out, form and shape, key in - try. Again and again until everything is moving smoothly and free of tension. These subtle modifications create near zero friction between keys and key guides. A faster, more balanced and more reliable playing feel is the result. We considered to offer the Premium Regulation as an option at extra charge. But in this case we would sometimes have to deliver MK22 Studios which do not have the best possible playing feel that we are able to provide now. This is unacceptable to us as it is our top model. Therefore, all MK22 Studios come with the Premium Regulation.